Background—Black tea is known to be a potent inhibitor of intestinal absorption of non-haem iron at least in healthy subjects. Aims—To investigate this effect in patients with genetic haemochromatosis, and, more importantly, the effect of regular tea drinking on the accumulation of storage iron in these patients over one year. Patients—Investigations were carried out on 18 patients with clinically proven genetic haemochromatosis. For the study of storage iron accumulation, they were separated into a group instructed to drink a particularly tannin rich tea regularly with meals and a control group. Methods—Intestinal iron absorption from a test meal was measured using whole body counting. Body iron stores were evaluated quantitatively by exhaustive phlebotomy, using haemoglobin, saturation of serum iron binding capacity, and serum ferritin for the assessment of body iron status. Results—A significant reduction in iron absorption was observed when the test meal was accompanied by drinks of tea instead of water. In the tea drinking group, the increase in storage iron was reduced by about one third compared with that of the control group. Conclusions—Regular tea drinking with meals reduces the frequency of phlebotomies required in the management of patients with haemochromatosis. Effective removal of excess iron from the human body is achieved only by venesection or sophisticated chelation induced excretion.3 4 Since these procedures are rather cumbersome and invasive, patients with iron overload syndromes such as genetic haemochromatosis (GH) or refractory anaemia are always looking for possibilities of reducing nutritional iron intake. An iron free diet is, however, not appropriate for long term use. Therefore, for such patients, reduced intestinal absorption of dietary iron would be beneficial. Ligands known to inhibit iron absorption include phytates, tannates, phosphates, oxalates, and carbonates; of these, tannates are the most potent inhibitors of non-haem iron absorption.5-9 Black tea represented by various brands is a foodstuff that is rich in tannates and is a popular beverage in many parts of the world. Although the inhibitory effect of tea drinking on iron absorption was recognised sometime ago,10-14 no clinical studies on its beneficial effect in the management of iron overload syndromes have until now been carried out. In this study patients with proven GH were used to investigate the inhibitory effect of tea drinking on body iron accumulation under conditions of normal life. From 10 commercially available brands of tea, the one with the highest content of tannic acids when extracted for five minutes using boiling water was selected. In the first part of the study, the effect of the selected brand of tea on intestinal iron absorption from a test meal was evaluated. In the second part, a controlled two armed study on the effect of regular tea drinking together with meals on iron accumulation in the body was carried out. Finally, the reaccumulation of storage iron over one year was assessed in tea drinkers as well as non-tea drinkers by exhaustive phlebotomy. 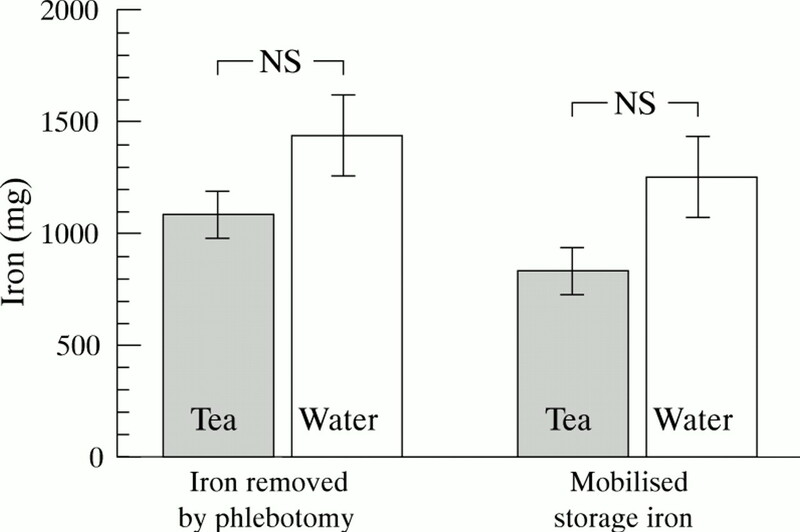 The difference in storage iron between the two subgroups represented the inhibition of iron uptake from food caused by regular tea drinking. A total of 18 patients (17 men and one non-menstruating woman) with biopsy proven GH were included in the study (table 1). One man participated twice. HLA serotyping disclosed a combination of A3/B7 alleles in seven patients, A3 (blank) in another seven patients, and B7 (only) in one patient. Four patients showed neither of these haplotypes. At the beginning of the study, it was not yet possible to determine the recently reported GH related defective MHC class I (HLA-H) gene.15 However, we could determine the amino acid dimorphism at codon 63 (H63D) and codon 282 (C282Y) of the HFE gene in 10 of the 18 patients after termination of the study. The data show that all patients investigated were homozygous for the C282Y mutation whereas none showed the H63D mutation. Mean age at the screening investigation (fig 1) was 46 (range 20–71) years. Mean (SEM) time since diagnosis of the disease was 5.4 (1.1) years. All patients had been followed since diagnosis regularly at least twice a year in our unit. These patients did not have any underlying malignancy, acute or chronic infection, or other major haemochromatosis unrelated disease. Outline of study design. MCV, mean cell volume; MCH, mean cell haemoglobin; TIBC, total iron binding capacity. All patients were informed in detail about the aims and requirements of the study and written consent was obtained from each. All patients completed the study. Baseline laboratory values are given in table 1. Amounts of mobilised storage iron after diagnosis show distinct differences, possibly because of the state of inheritance and disease duration. Figure 1 is an outline of the study. In all but two patients (1.9 and 2.5 in table 1), who had not previously been phlebotomised, the study was initiated at least six months after the last phlebotomy. After an initial assessment of body iron status, intestinal iron absorption from a test meal was measured twice consecutively, with and without tea to evaluate the intraindividual inhibitory effect of tea. Thereafter patients were phlebotomised until serum ferritin was decreased to less than 50 μg/l in order to achieve homogeneous low normal iron stores in all subjects. Subsequently the patients were allocated according to their customs and wishes with regard to tea drinking into group 1, taking meals with tea, and group 2, having meals without drinking or with beverages other than tea. In addition, all patients were advised not to drink alcohol for at least one hour before until one hour after meals. To our knowledge, no patient with higher than normal alcohol consumption was included in the study. The assignment of the patients to the groups was consciously not randomised as, because of the long observation period, randomisation would probably have decreased patient compliance with the protocol. Although the distribution into the two groups was not random, the groups did not differ significantly in any variable at the beginning of the second part of the study (table 1). During the following 52 weeks, control measurements of haemoglobin, packed cell volume, mean cell volume, mean cell haemoglobin, serum iron concentration, total iron binding capacity (TIBC), saturation of TIBC, and serum ferritin concentration were performed every four weeks. Thereafter, iron stores accumulated during this period were evaluated by quantitative phlebotomy.16 17 One of the patients consecutively joined both groups (table 1; 1.7 and 2.7 respectively). Ten brands of Indian and Ceylon tea were tested, from which was selected one of Ceylon origin that had the highest content of polyphenols (“Wewesse Ceylon Broken”). The total amount of polyphenols was determined by extraction of 1.5 g tea with 250 ml boiling water by the methods of Schneider18 and Schorn.19 The amount of polyphenols extracted is a function of time (fig 2). After five minutes of extraction, about 90% of the polyphenols appear in the aqueous phase. Time dependence of extraction of polyphenols from 1.5 g “Wewesse Ceylon Broken” tea with 250 ml boiling water. Patients in group 1 were advised to use 1.5 g of the selected tea, extracted for five minutes with 250 ml boiling water, over the period of the investigation. They were instructed to drink the tea with meals three times a day without any additions such as lemon or milk. Intestinal iron absorption from a test meal was measured by using a whole body counter with invariant response with respect to the distribution of radioactivity within the human body.20 The test meal was composed of beef, rice, spinach, and potatoes in a homogenised form. The total mass of 190 g included 5.7 g protein, 5.7 g fat, and 11.4 g carbohydrate. The total iron content was 5.9 mg, of which 3.6 mg was non-haem iron. Immediately before application, the test meal was labelled extrinsically with 30 kBq 59Fe as citrate in sterile saline.21 The iron content of the extrinsic label was less than 1 μg. After careful mixing, the meal was eaten with a plastic spoon. The test meal was given twice, in the morning after an overnight fast. Subjects continued fasting for at least two more hours. Measurements of total body radioactivity were carried out before the meal (individual background), after the meal and seven and 14 days later. On the first occasion, 200 ml of the tea was given together with the meal, whereas on the second occasion—that is, two weeks later—the same volume of tap water was given with the meal. To keep the amount of radioactivity administered as low as possible, the order of the two consecutive absorption tests was not random. Because of the low iron content of the test meal and the time interval of two weeks between the two tests, any effect of the first absorption on the second test could be excluded. All measured count rates were corrected for individual background and for decay of radioactive iron to the time of application. During the second course, the count rates were also corrected for 59Fe radioactivity remaining from the first absorption test. Percentage iron absorption (A) was calculated using the equation: A=Z14−ZbZo−Zb×K14×100% where Zb is individual background—that is, count rate of whole body γ rays in energy band 1.00–1.45 MeV before the test—Z0 is the count rate after the meal, Z14 is the count rate 14 days after the meal, and k14 is the correction factor for radioactive decay of59Fe over 14 days—that is, 1.243. In addition, the ratio of count rates after seven days to that after 14 days (V14.7) was calculated as follows: V14.7=(Z14−Zb)k14(Z7−Zb)k7 where Z7 is the count rate seven days after the meal and k7 is the correction factor for radioactive decay of 59Fe over seven days—that is, 1.115. Haemoglobin and the serum transaminases aspartate aminotransferase, alanine aminotransferase, and γ-glutamyl transpeptidase (GGT) were measured by standard methods. Serum iron, TIBC, and serum ferritin were measured as described by the International Committee on Standardisation in Hematology (ICSH).23-25 Table 1 gives patient and laboratory characteristics at the beginning of the study. Genomic DNA was extracted from whole blood samples anticoagulated with EDTA by the salting out procedure. The amino acid dimorphism at codon 63 (H63D) and codon 282 (C282Y) of the HFE gene was defined by polymerase chain reaction (PCR) amplification of genomic DNA samples followed by restriction enzyme digestion as described elsewhere.26 The H63D dimorphism was analysed withBclI and MboI, and the C282Y dimorphism withRsaI and SnaBI. Restriction enzymes were used as recommended by the manufacturer (Stragene GmbH, Heidelberg, Germany) at a concentration of 4 U/μg DNA for 10 hours in a final reaction volume of 20 μl. Products were separated by standard gel electrophoresis using 3% NuSieve/1% agarose (Agarose NA; Pharmacia Biotech, Uppsala, Sweden; NuSieve GTGagarose; FMC Bioproducts, Rockland, Maine, USA) for one hour at 100 V. Gels were stained with ethidium bromide (0.5 μg/ml). Table 2 gives the results of the radioactive iron absorption tests. The individual fractions of iron absorption from the test meal show considerable variations. However, in each patient the absorption was reduced when the test meal was given together with tea. On average, intestinal iron absorption was reduced from 22.1 to 6.9% by the addition of tea compared with water—that is, a reduction of about 70% (p<0.001). In contrast, mucosal iron transfer (V14.7) was unaffected by tea. On both occasions the mean values of V14.7 were significantly increased (0.96 (0.03) and 0.94 (0.02)). Normal healthy non-menstruating adults have been reported to have a V14.7value of 0.58 (0.02).17 28 The differences are statistically different (p<0.001). According to the study regimen, at the beginning of the observation period (fig 1) both groups showed comparable mean values of serum iron and TIBC in the normal range (tea group: 15.4 (1.4) and 45.3 (3.9) μmol/l; control group: 19.9 (2.9) and 47.5 (1.3) μmol/l). Mean levels of serum ferritin were 27 (3) μg/l in the tea group and 35 (4) μg/l in the control group. In all patients haemoglobin values were within the normal range and remained almost unchanged during the whole observation period. Figure 3 shows the changes in saturation of TIBC and serum ferritin concentration during the observation period. Saturation of TIBC showed an increase in both groups after four weeks. Thereafter the increase in the control group was much more pronounced than in the tea drinking group. However, after one year both groups ended up with almost the same increased level of TIBC saturation. There was a difference in the increase in serum ferritin concentration between the two groups. Applying linear regression analysis, the increase in serum ferritin per week for the tea drinking group is given by Fn = 2.78(t + 14) (r = 0.98; p<0.001) and for the control group Fn = 4.26(t + 13) (r = 0.95; p<0.001), where Fn is serum ferritin concentration (μg/l) and t is observation time (0 to 52 weeks). Time course of serum ferritin concentration and saturation of total iron binding capacity (TIBC) (means (SEM)) in patients with genetic haemochromatosis during one year without phlebotomy treatment. The iron mobilised during the venesections17 after the observation period (fig 1) was 1085 (106) mg in the tea drinking group and 1436 (178) mg in the control group (fig 4). 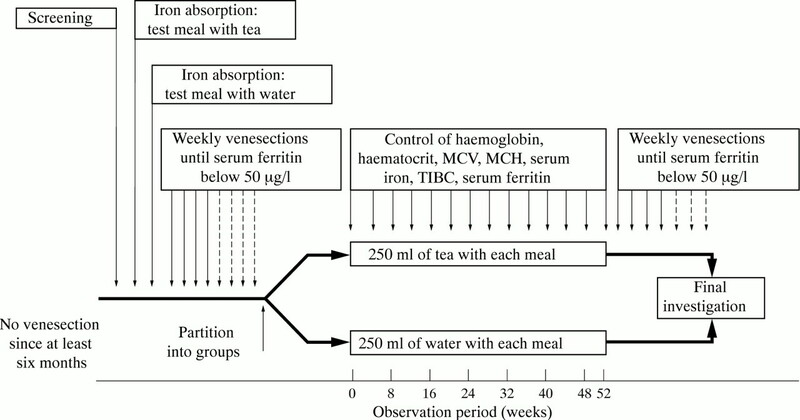 When corrected for intestinal food iron absorption during the second venesection period,17 the values for reaccumulated storage iron within the observation period of 52 weeks were 827 (105) mg in the tea drinking group and 1256 (173) mg in the control group (fig 4). Although the level of iron accumulation was about 50% higher in the control group than the tea drinking group, the difference did not reach statistical significance. Storage iron accumulated over one year. Columns on the left show the amount of iron removed by phlebotomy in the tea drinking and control groups at the end of the observation period; columns on the right show mobilised storage iron, calculated as iron removed by phlebotomy corrected for iron absorbed during the time course of the phlebotomies (see the text). The differences between the tea and water drinking groups are statistically not significant (t = 1.63 and 2.04; p<0.05 would require 2.12). 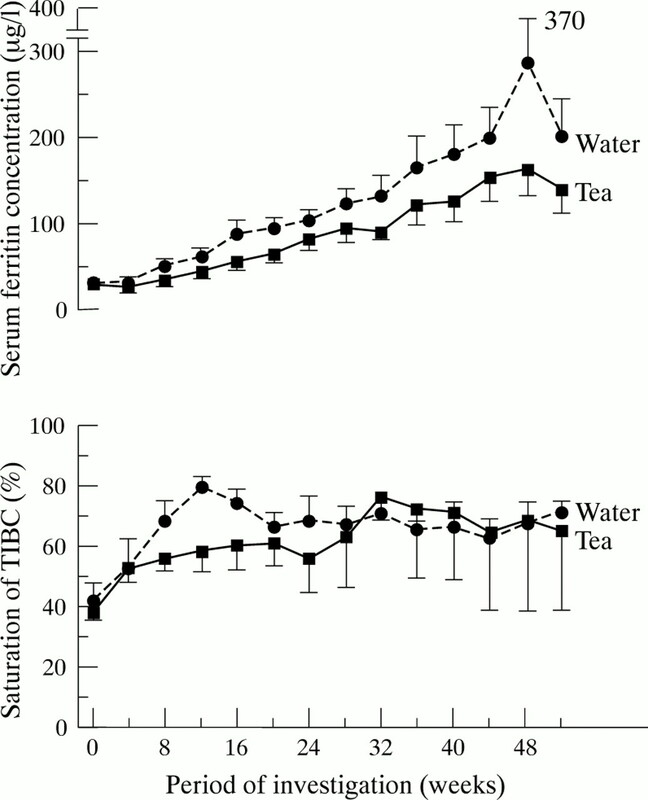 The inhibitory effect of tannates of vegetable origin on intestinal iron absorption has been shown in various studies.6 7 9 Black tea in particular, a commonly used beverage, has been shown by Disler10 and others7 11-13 to reduce the uptake of iron from various sources of inorganic iron by about two thirds as compared with water intake. In this study we confirmed the inhibitory effect of black tea on intestinal iron absorption in patients with genetic haemochromatosis. All previous studies were carried out on healthy subjects or patients with refractory anaemia. To our knowledge no studies on patients with GH have so far been published. At the beginning of this study, all patients clinically manifested iron overload. The state of inheritance (homozygosity/heterozygosity) was investigated by pedigree analysis whenever possible. Thus subjects 1.2 and 1.1 and 2.8 and 1.9 are fathers and sons, and 2.5 and 2.6 are mother and son respectively. All ten patients who could be investigated for the HFE gene, available for determination only after termination of the study, were homozygous for the C282Y mutation. In addition, in all subjects the clinical expression of the gene defect could be shown by an increase in V14.7 at the beginning of the study (table 2). These findings are supported by the amount of increased mobilisable storage iron at the time of diagnosis (table 1), as well as by the reaccumulation of storage iron during the observation period, especially in those patients who did not drink tea (fig 4). The brand of tea used in the study was selected for the highest tannin content possible. To help patients comply with the protocol of the long term study, preparation time did not exceed common practice. In addition, the taste of the tea was made as acceptable and pleasant as possible. According to German custom, a Ceylon brand (a particular sort of “Wewesse Ceylon Broken”) and five minutes extraction time were recommended to the patients. 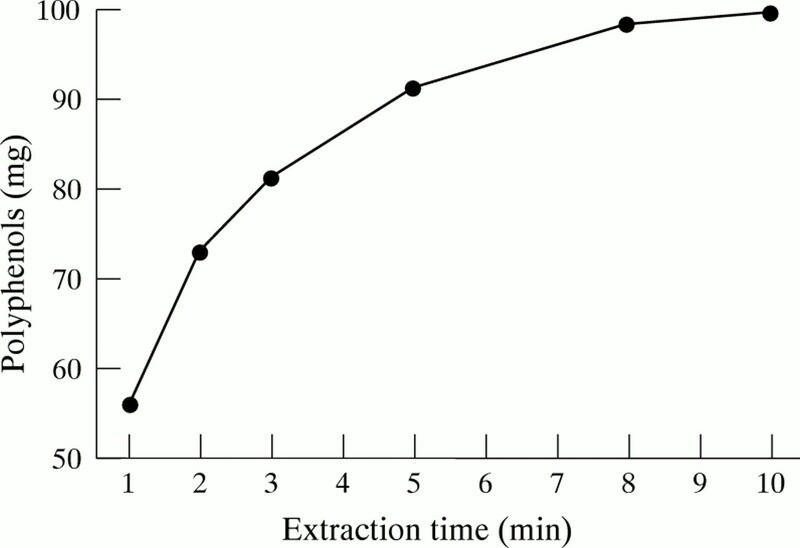 As shown in fig 1, a five minute preparation time results in about 90% yield of the extractable polyphenols. This protocol was well accepted by the participants, and all patients assigned to the tea drinking group were happy to continue with tea drinking during meals after termination of the study. Polyphenols are assumed to act by binding heavy metals in the gastrointestinal lumen.31 This is confirmed by our study, as we showed that, despite the significant reduction in iron absorption, mucosal transfer remained unchanged. The values for V14.7 remained the same (table 2) whether the test meal was given with or without tea. The increase in mucosal transfer (V14.7) over that in healthy subjects shows that the defect in iron absorption due to haemochromatosis is still present. Consequently, the observed reduction in iron absorption caused by tea in haemochromatosis can be attributed to luminal binding of iron to the polyphenols. Because of the ability of polyphenols in black tea to convert dietary non-haem iron into a form unavailable for absorption, it seems reasonable to utilise this common beverage to reduce iron uptake and accumulation in iron overload syndromes, as has already been suggested by De Alarcon et al.11 Whereas the inhibitory effect of tea on non-haem iron absorption has clearly been shown in single dose experiments, the prolonged action on iron balance with respect to the frequency of iron deficiency has so far only been investigated in healthy infants.32 In our study, the effect of regular tea drinking during meals on accumulation of storage iron in patients with GH was studied. The drinking of tea with main meals is not common in Germany. Therefore the study patients were carefully advised on how to prepare and use the selected brand of tea. Since iron accumulation in patients with GH is a slow but perpetual process, the effect of tea on accumulation of storage iron was investigated by a controlled prospective study carried out for a period of one year. The initial iron status of both groups (tea and non-tea drinkers) was comparable (table 1). As a result of the venesections performed between the two iron absorption tests and the beginning of the observation period (fig 1), the body iron status of all patients was low normal. As could be expected, haemoglobin concentrations were almost constant throughout the study. Saturation of TIBC showed an early increase during the first three months in the control group, as is usually observed in the post-phlebotomy phase33 (fig 3). In contrast, in the tea drinking group, there was a much slower increase in iron saturation of TIBC during the first six months of the study (fig 3). From the data presented it is evident that regular tea drinking with meals reduces storage iron reaccumulation in patients with genetic haemochromatosis, but to a smaller extent than could be expected from studies on single doses. Statistical significance was not reached in this study. Nevertheless, drinking of tea with meals can be recommended as an additional therapeutic tool for the maintenance of normal body iron status in pretreated genetic haemochromatosis. It should, however, be remembered that, even with regular tea drinking, phlebotomies are still required, but with reduced frequency. The use of higher doses of polyphenolic compounds than those used in this study is possible, but the usefulness of this approach may be limited by side effects and also taste, reducing patient compliance with the recommended regimen—that is, lifelong daily use. The authors wish to thank Professor H Glasl, Institut für Pharmakognostik, Johann Wolfgang Goethe-Universität Frankfurt for determination of the polyphenol content of the different brands of tea. The valuable technical assistance of Mrs U Tacke, Mrs H Hahn, and Mrs A Huck is appreciated. The authors are also indebted to Dr J Atta and Dr G Seipelt for their help in the preparation of the manuscript. (1992) High stored iron levels are associated with excess risk of myocardial infarction in eastern Finnish men. Circulation 86:803–811. (1988) Body iron stores and the risk of cancer. N Engl J Med 319:1047–1052. (1989) Desferrioxamine-induced iron excretion in humans. Baillière’s clinical haematology. ed Hershko C (Baillière Tindall, London, Philadelphia, Sydney, Tokyo, Toronto) :323–44. .
(1989) Results of long-term subcutaneous desferrioxamine therapy. Baillière’s clinical haematology. ed Hershko C (Baillière Tindall, London, Philadelphia, Sydney, Tokyo, Toronto) :345–62. .
(1950) The effect of phytate and other food factors on iron absorption. J Nutr 41:433–446. (1984) Factors affecting the absorption of iron from cereals. Br J Nutr 51:37–46. (1989) Iron absorption and phenolic compounds: importance of different phenolic structures. Eur J Clin Nutr 43:547–558. (1981) The inhibitory effect of soy products on nonheme iron absorption in man. Am J Clin Nutr 34:2622–2629. (1991) Dose-dependent inhibitory effect of phenolic compounds in foods on non haem iron absorption in men. Am J Clin Nutr 53:554–557. (1975) The effect of tea on iron absorption. Gut 16:193–200. (1979) Iron absorption in the thalassemia syndromes and its inhibition by tea. N Engl J Med 300:5–8. (1982) Effect of different drinks on the absorption of non-heme iron from composite meals. Hum Nutr 36A:116–123. (1983) Inhibition of food iron absorption by coffee. Am J Clin Nutr 37:416–420. (1995) Excessive tea consumption can inhibit the efficacy of oral iron treatment in iron deficiency anemia. Haematologica 80:518–520. (1996) A novel MHC class I-like gene is mutated in patients with hereditary haemochromatosis. Nat Genet 13:399–408. (1952) Iron metabolism. Iron stores in man as measured by phlebotomy. J Clin Invest 31:543–547. (1989) Diagnosis and clinical evaluation of iron overload. Baillière’s clinical haematology. ed Hershko C (Baillière Tindall, London, Philadelphia, Sydney, Tokyo, Toronto) :363–90. .
(1975) Zur Bestimmung der Gerbstoffe mit Casein. Arch Pharm (Weinheim) 309:38–44. (1979) Ratahiae Radix. Pharmacopoela Europaeica 2:1114–1118. (1976) A whole-body counter with invariant response. Diagnosis and treatment of incorporated radionuclides. (International Atomic Energy Agency, Vienna), pp 231–235. (1972) Food iron absorption measured by an intrinsic tag. J Clin Invest 51:805–815. (1976) Therapie der Hämochromatose. Therapiewoche 26:625–635. (1978) The measurement of total and unsaturated iron binding capacity in serum. Br J Haematol 38:281–290. (1978) Recommendations for the measurement of serum iron in human blood. Br J Haematol 38:291–294. (1991) Stable lyophilized reagent for the serum ferritin assay. Clin Lab Haematol 13:297–305. (1997) Increased frequency of the haemochromatosis C282Y mutation in sporadic porphyria cutanea tarda. Lancet 349:321–323. (1972) Statistische Auswertungsmethoden. (Springer Verlag, Berlin, Heidelberg, New York). (1978) Untersuchungen zur Regulation des Eisenhaushalts. Nuklearmedizin, Nuklearmedizin und Biokybernetik. eds Oeff K, Schmidt HAE (Medico Informationsdienste, Berlin) :122–5. .
(1990) Iron absorption. in Aspects actuels des carence en fer et en folates dans le monde. eds Hercberg S, Galan P, Dupin H (INSERM, Paris), pp 235–245. (1990) Effect of green tea on iron absorption in elderly patients with iron deficiency anemia. [English abstract]. Japanese Journal of Geriatrics 27:555–558. (1975) The mechanism of the inhibition of iron absorption by tea. South African Journal of Medical Science 40:109–116. (1985) Tea drinking and microcytic anemia in infants. Am J Clin Nutr 41:1210–1213. (1980) Idiopathic haemochromatosis. Iron biochemistry and medicine. eds Jacobs A, Worwood M (Academic Press, London, New York) :461–98. .
(1987) Serumferritin bei Eisenüberladung. Folia Haematologica 114:319–337.